I am lucky enough to be able to go around Utah working with museums all across the state. 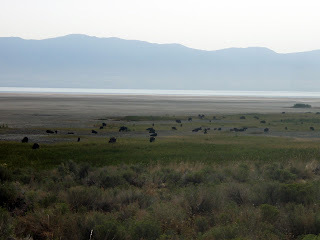 A little while ago my colleague, Megan, and I visited Antelope Island State Park in the middle of the Great Salt Lake. Even though I have lived in Salt Lake for most of my life I had never been there. What a mistake. I loved the wild beauty of it. Antelope Island is the largest island in the Great Salt Lake. The first Europeans to visit were John C. Fremont and Kit Carson. They said they shot a pronghorn antelope on the island and so named it Antelope Island. But pronghorns are not antelope so we are stuck with an inaccurate name. In the late 19th century and herd of Buffalo were introduced to the island and have now become a unique genetic herd, and one of the oldest. But the America buffalo are not really buffalos, they are really Bison so we are wrong on two counts. Here is the only picture I could take of the herd. The black blobs are bison. While on this journey, I was lamenting the fact that I married a man who hates knitted things. This is terrible news for a knitter. Who do I make things for? How do I show my love? Megan said that I was perfectly welcome to make her something if my husband doesn’t want anything. Megan has been a dear friend and I want to knit her something that I create, something that will remind us of our adventures around the state over the last three years. Something that will remind us of our trip to Antelope Island.